The History of ‘The Big Hina Matsuri’ – Katsuura, Tokushima. The central pyramid of The Big Hina Matsuri, Katsuura. Katsuura is a rural town of around 6,000 people lying roughly 12 miles south-west of Tokushima City. The town is known locally for growing mikan oranges and for hosting one of the largest doll festivals in Japan. 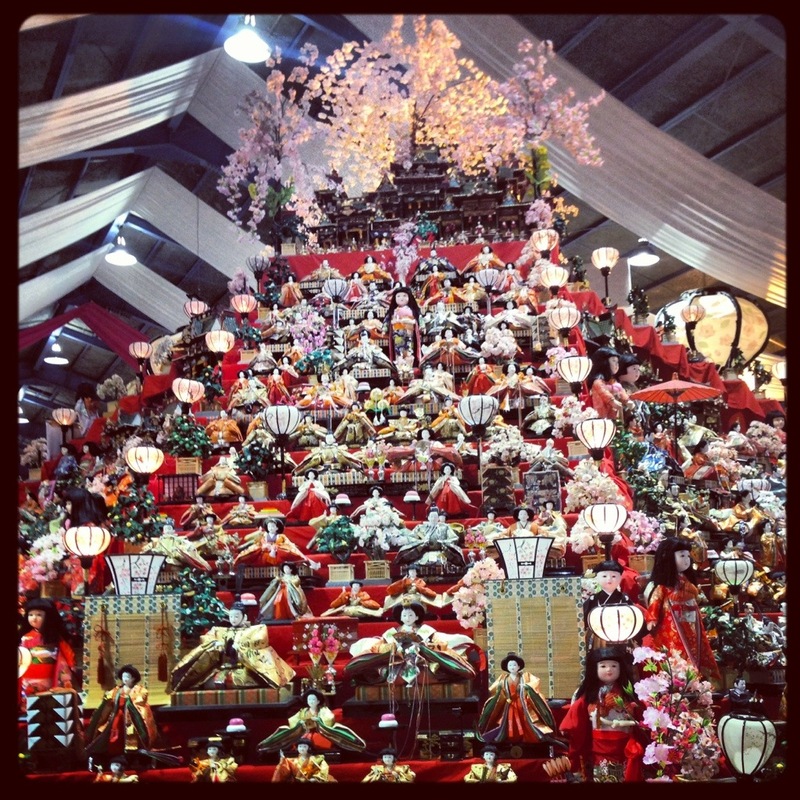 The origins of doll festivals in Japan can be traced back to the mid-Heian era, 1000 years ago. Rituals using dolls as human representations were carried out in early March to drive out evil spirits. They were purified with water – washed, sent down river and out to sea. These beautiful dolls are still viewed with suspicion, the reason so many are donated by the public is that they are thought to bring bad luck if disposed of when the owners no longer have room for them. Young girls from wealthy families had long enjoyed playing with dolls, early examples of which can be viewed in both Katsuura and the Tokushima Castle Museum. This custom soon spread to all levels of society. From the beginning of the Edo period dolls became popular gifts for newborn girls, doll markets were held in major towns and the dolls themselves became more elaborate and valuable. In response, the Shogunate issued decrees to keep the majority of dolls plain, simple and low cost. In the Meiji period, the government discontinued hina events, partly due to their feudal associations. New national holidays were established. Nevertheless, the tradition remained popular – Children’s Day was made a national holiday in the postwar period and the doll festivals gradually returned. In 1981, a harsh winter hit agricultural production in Katsuura and the townspeople decided to host an annual festival to reverse the town’s fortunes. In 1985 a committee was formed and the decision to host “The Big Hina Doll Festival” was reached. The committee set about collecting enough dolls from residents of the town, and further afield, to fill a 100 stepped pyramid 3.4 metres high. The first festival was held over two days in April 1988. Over time, the festival became more and more popular so it became easier to source dolls to display. People from across the country send dolls and doll cases to Katsuura Town Office every year. Approximately 10,000 dolls are donated annually with 30,000 dolls on display in total. The festival, which now runs from late February to early April, receives a great deal of media coverage and the town receives more than 30,000 visitors each year. At the end of the festival surplus dolls are given to visitors as gifts and hina dolls have been officially sent to more than twenty countries as international gesture of goodwill. In 2004 the festival organisers acquired a disused woodwork factory and transformed the space into an exhibition hall, a symbol of the shift of the town’s economy from agricultural production to tourism. The Big Hina Matsuri in Katsuura supports the local economy while being a great source of community pride and purpose. This is particularly important at a time when many small towns across Japan are facing an uncertain future. This renewed sense of community purpose and the boost to the local economy is reminiscent of the Awa Odori festival in the prefectural capital. However, like many other ‘traditional’ Japanese festivals across the country, the motivations for hosting the festival and the history of the event are more recent than they may appear. ビッグひな祭り will be on display in Katsuura until April 7th this year!